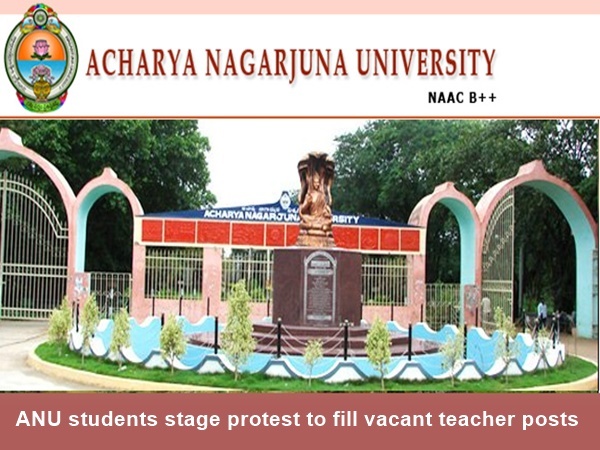 The engineering students of the Acharya Nagarjuna University on Thursday staged a dharma on the ANU campus demanding filling the vacant posts and resolving other issues. The students of ANU College of Engineering in large number rushed to the administrative block and squatted on the ground. As the ANU officials did not show any response, the angry students squatted in front of the VC chamber. They alleged that the the syllabus could not be completed due to the vacant faculty posts and demanded filling of those posts at least with guest faculties. They further alleged that there is no placement cell in the engineering college which is barring students from getting jobs and demanded starting of skill development and placement cell. The girl students complained against hostel warden and the hostel lacked basic amenities. ANU Vice-Chancellor Prof. A. Rajendra Prasad rushed to the spot and tried to pacify the agitating students but in vain. Later Prof.Rajendra Prasad enquired about their difficulties. The hostel staff, including warden announced their resignation saddened over the complaints. The students objected to the resignation threat and affirmed that they want betteramenities.